(Chicago, IL) — June 15, 2010. 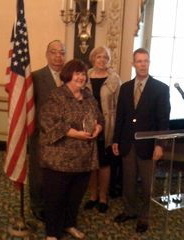 As part of a year-long celebration that will culminate in Jane Addams’150th Birthday Celebration in September 2010, the Jane Addams Women of Valor Award today was presented to Margaret Berglind, LCSW, and longtime NASW Illinois Chapter member. Berglind is president and CEO of Child Care Association of Illinois. The Child Care Association of Illinois (CCAI) promotes, protects, advocates for, and strengthens a responsive, not-for-profit service delivery system and shapes public policies for the benefit of children and families. “Marge is true advocate for the member child welfare agencies and articulates the needs and the realities of the child welfare system in the state of Illinois,” said Terri A. Johnson, Vice President, Policy & Advocacy at the Jane Addams Hull House Association. “I’m proud and humbled to received this distinguished honor,” said Berglind. The keynote speaker at the event was Dr. Creasie Hairston, dean of the University of Illinois Jane Addams College of Social Work.